European Opportunities – how to access them? “It is not enough for the information just to be on a platform – it has to be presented in such a way, that everyone could access it easily”, - Eurodesk Brussels Link director Fabrice Gonet expressed his insights. According to him, these days it is extremely important for youth to stay mobile. Information for young people has to be delivered in a clear and accessible way. That is the mission Youth portal Eurodesk executes: to inform the youth about programs that have EU financial support from in following areas: studying abroad, volunteering, learning, travelling or internship. Fabrice Gonet office, located in Brussels, is coordinating all the non-governmental organizations or organizations sponsored by the Ministries taking care of any kind of youth affairs: mobility, enterprising and other.This program, hosted by European Commission, is now working in 33 countries of Europe. Journalist Patricija Babrauskaitė, the representative of Lithuania’s Eurodesk youth portal “Žinau viską“ had an interview with Fabrice Gonet. What is the mission of Eurodesk? 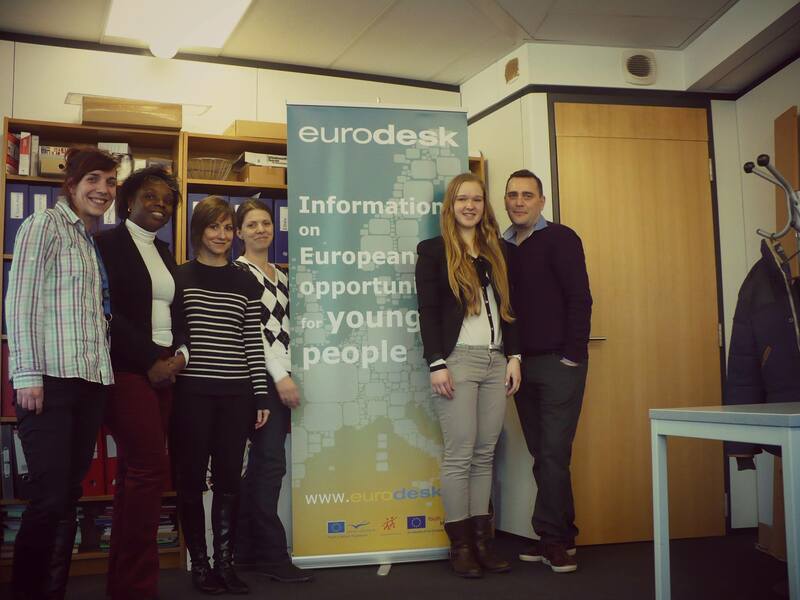 Eurodesk goal is to attract as many young people as possible. Of course, not every young person is determined to leave his hometown and just go abroad to some kind of a project, but the benefits of such experience are clear. Maybe there are people who would like to see other countries and to learn other cultures, but they just do not know where to apply to get the information about opportunities. Therefore, Eurodesk purpose is to provide the knowledge about many projects, where every young person could participate. Is it easy to know and evaluate the projects’ expectations, when you know only the main things about it: place, information about the date and purpose? Certainly, it is not enough. The article has to include some kind of description of the real experience about the participation in a project. That is because young person has to get support from others which may encourage him to attend. Sharing experience is not only motivating but also a good way to develop important information about the project. Spreading the information which is worthwhile – that is what Eurodesk is all about. It is just like a platform where you can hear about other experiences while volunteering or working abroad, and share your own. In which cases’ sharing the real experiences is more useful than a brochure about the project? Eurodesk is sharing the good experience. Students write articles about their insights on participating in projects. The information spread is the most effective way to encourage young generation to become active citizens. Real experience motivates and encourages others. When someone is sharing their excitement about the participation in an international project, and if you have not ever traveled, you can only imagine how it was. For example, if I tell you: “You should go to Spain to volunteer”, it will not be a good argument, because it is unclear and unsupported. The questions would follow: “Why Spain, what is special about it?” However, if I share my experience, and tell that I have met so many great people, visited lots of amazing places, and improved my Spanish skills, it would be a much more attractive argument. All in all, the most important thing is give the information about the actual things happening. Eurodesk is a platform for that. What advantages does the international mobility have compared to local mobility? It is possible to volunteer and in local organizations and events as well. One can gain lots of experience in local programs as well, there are volunteering options. However, international mobility is important, because it gives new perspectives. Not only does the international mobility develop lots of new opportunities, but also it encourages a person to go discover new horizons beyond his comfort zone. That is because one faces other cultures, people with different attitudes. Therefore one can even learn about oneself better while facing various situations. I wish I had had such an opportunity while I was young. The participation in many different projects is a great way to discover what you really want in life. I believe that nowadays it is important for young people not to go straight to university. One has to prepare and decide what exactly want to do. Of course, there is always a risk, but in this case it is much more to gain. At the end of 2013 Lithuania had passed on the wheel of chairing the European Council to Greece. One of their main priorities is youth enterprising, support to adapt to labor market easier. This aspect is kind of similar to the main Eurodesk goal – youth mobility. The remark about Greece priority to adapt youth to labor market is pretty good. Every experience gives an opportunity to improve communication skills, which is the most important attribute in every job. Only in this way a young person can effectively gain skills in different things. Moreover, international mobility is encouraging to improve foreign language skills. Because of this all the information about the opportunities is important. What access does a young person have to information about volunteering opportunities, exchange programs? It is not enough for the information just to be placed somewhere. It has to be represented so that we can reach it easily. For example, European Commission is presenting their articles in a very formal style, according to certain ethics rules. Because of this, it does not attract youth’s attention – the information is too complicated. Eurodesk is trying to cope with this problem by spreading the news in their language. Therefore, European youth portal is an important tool as it is trying to present the information clearly. These days, the portal is represented in 33 European countries and is translated in 26-27 different languages. What interactive tools are the most useful and popular while representing the news? We use interactive media, short and clear topics with attractive images. However, the most important thing is visual expression so that every piece of news would be attractive. As you mentioned, all news are shared in nearly 27 different languages, so to spread the information globally is not easy. This year, we are focusing on interactive online expression. Facebook and other social sites are great platforms to spread the information. There are many users, however, news do not last long in social network. Therefore Eurodesk has to keep fresh attitude. Do the young people use these opportunities? According to the research of 2012, only 20% of Lithuanian youth is involved to any informal education. Why the number is so small? We are trying to involve as many young people as we can. However, our purpose is just to share the news, not to sell it by persuading young people. People often go volunteering not because they find out the information about the exact opportunity in Eurodesk page, but because they are interested in volunteering in general. Our purpose is to guarantee that every person will have an access to information about international project opportunities. Whether they accept it or not – it is their choice. The most effective program on youth mobility supported by European Commission is “Erasmus+”. What do you think about it? “Erasmus+“ program’s purpose is to encourage youth mobility. For the period of 2014–2021 the fund is even 40% higher than before. Therefore, in addition to the exchange programs, the information delivery will be financed as well. Furthermore, “Erasmus+“ is intended not only for youth but also for everyone who is involved in youth work. Mobility is one of the main priorities – but there are many more. One of the main goals is involving young people in active civic participation. You have mentioned that you were working in South America – Argentina. You have seen many different cultures, people. Could you share your insights about their approach? Every nation is so different. I have been working abroad in several past jobs. There people finish secondary school by the age of 17, so it is not easy to compare. However, it is common for them to get a gap year and to do something extraordinary during it. Some of them go to foreign countries – this year is dedicated to exploring the world. After going back, they start studying in university. A 17-aged-person is too young to know what they exactly want from life. What were your career expectations and plans? After graduating from secondary school I went straight to study in Germany. At the end of my studies over there I realized that I do not even want to be a teacher, but I had no other career visions. If I had had an opportunity to go volunteering after secondary school, I would have definitely gone to taking part in such a program. So the conclusion is that we should encourage young people not to jump straight to university education. It is important to know what you want to do with your life, so taking a year to think about it and try something new is a great investment. If you were young, which mobility opportunities would you use? When I was your age there was no Internet – the most important information spreaders were our teachers and family members. The programs that are now hosted by European Commission did not exist at all. Volunteering, as a term, was not popular when I was a teenager. So, if I was young again, I would really like to participate in ant volunteering program. Press office representative Gediminas Vilkelis working in Brussels also kindly agreed to share his insights. One of the issues faced nowadays is to encourage youth mobility, and to give easier access to the information about volunteering, exchange program opportunities. In your view, does this experience have benefit? Right now everyone is complaining about the brain drain: state invests money in education, and young people just leave. I personally see no problem here. A person gains valuable experience while abroad. And if situation is favourable, they will surely come back. We have many examples of young people coming back and jumping straight into the labour market. And they do not come back for the salary. They come back, because they have a vision, an idea.